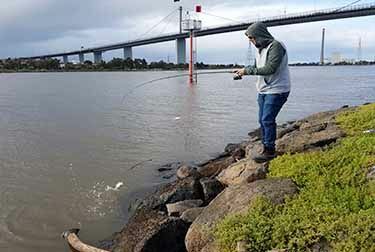 Michael Smith braved the horrendous weather conditions to do a brief soft plastic fishing session not far from the West Gate Bridge. Using mainly Zman grubs in colours motor oil, black and white pearl, Michael caught many eager small Salmon and Bream. Michael also lost a couple of decent size Bream on the rocks. Its a terrific effort in the conditions that were cold, wet and very windy.